If you are reading this article you will notice at the bottom of the blog post the Other Interesting Topics which are in relation to the Related post on which we are going to talk about on this article. 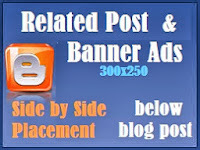 Beside the Other Interesting Topics, I have banner ads 300x250 space where you can put additional blog advertisement. This Related Post and Banner Ads show side by side below of every Blog Post is useful in relation to the calculation of space consumption and uniqueness. Not all templates have this option that's why I created this tutorial for those who doesn't have one. Having a related post on your blog is important because this will maximize your potential to connect and bridge the continuity of reading journey of your readers. There are readers who would like to read more about the topic and the best thing to do is give them options to read again. These options will eventually make your site look good and professional, thus, substantial, which gives a good impression to the viewer. This article will help you have that related post appear in your site as well. You will be guided along the way as long as you will follow the step by step procedure. Great tutorials for new bloggers! awesome tutorials. I just don't even like to think about all that code...So glad there are geniuses like you to help us all! I am not genius, ahahaha... I am just same as all bloggers like you. I am just more familiar with these coding.. happy blogging! good day sir.. i got an error after pasting the Step 4. Error parsing XML, line 1187, column 94: The reference to entity "callback" must end with the ';' delimiter.